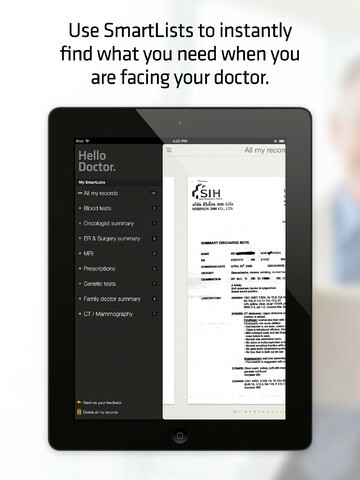 The Hello Doctor iPad app helps you organize and store your medical information for quick, easy access. The elegant interface and nice tools elevate it to a must-have download from the iTunes App Store. You start with a simple email and password set-up, and you quickly move to the clean, neat home screen. The home screen has two icons in the upper right corner of the screen. One is the share icon which incorporates one-touch sharing via email and fax. The second icon is a plus icon to add your documents. The plus icon to add your documents gives you three simple options. You can shoot a photo with the in-app camera, import a photo from your iPad photo library, or import from Dropbox. You will be required to authorize access to your iPad photo library and Dropbox. The in-app camera functions nicely, and the iPad photo library sync is smooth. For Dropbox, your libraries are contained in a pop-up on the screen. 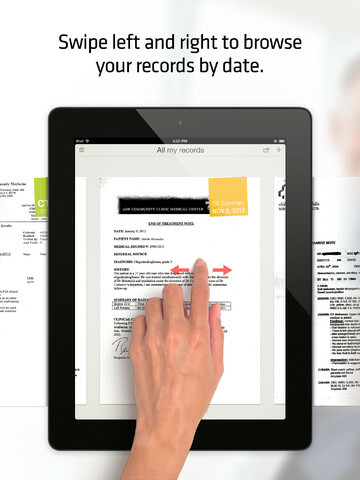 You touch your photo or document to copy it to the Hello Doctor iPad app. You can crop the information by dragging the four corners. You touch the rotate button at the bottom of the screen to change the orientation. Finally, you select the document type to save. The Hello Doctor iPad app incorporates a vast range of categories by default. The range of surgical reports to prescriptions to specialists and more gives you a chance to find an appropriate category. Once you have categorized an upload, a post-it note graphic with the category and date is clipped to the corner. Each category has a color code that follows throughout the interface. You can sort your records and view them by category by touching the list icon in the upper left corner of the screen. A list of categories slides from the left, and you can touch a category. One item missing from the Hello Doctor iPad app is the ability to tag a family member or add a family member as a custom category. This could be an invaluable tool for families, as you could manage each child’s immunization information, physicals, and medical documents nicely with one touch sorting. The Hello Doctor iPad app is an excellent tool to manage on-going medical problems, store your documents for easy access, and has the potential to be as important as a shared Google calendar for moms and dads. AppSafari review of Hello Doctor – Medical records organizer was written by Jenni Ward on July 9th, 2013 and categorized under App Store, Featured, Health, iPad apps, Productivity. Page viewed 5570 times, 1 so far today. Need help on using these apps? Please read the Help Page. Thanks for the great review, Jenni! As for your suggestion to manage family members’ records, you’re absolutely right, and we hope to ship this feature ASAP. I haven’t received sufficient information on the encryption, security and safety on this product to satisfy my requirements.